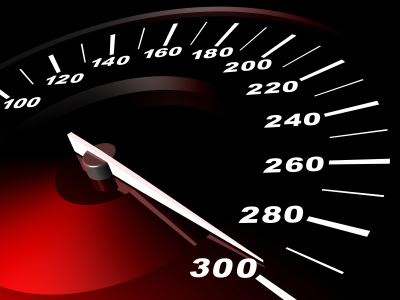 Do you want to speed up your blog? Read this post for 7 easy ways to do just that! This morning I visited, or rather, tried to visit a blog that loaded so slowly, I was transported back to 1996, when we used 28.8K dial-up modems and almost every site took forever to load in a browser. Actually, I was so frustrated by the long loads back then, that I remember declaring that the Internet was ‘too big a waste of my time’, pushing the chair back from my roommate’s computer and staying away from it for many months thereafter. But when my roommate took his computer to his new posting, curiosity got the better of me. With a used IBM laptop, I discovered that the Internet had evolved rather quickly during those months and I was soon hooked on all the Internet had to offer… especially from sites where I could get information FAST! Nowadays, there is absolutely NO excuse for having a site that loads slowly, especially if you want to make money online. One of Google’s basic ranking factors is site speed. According to SearchMetrics.com’s SEO Ranking Factors -Rank Correlation 2013 for Google USA article, “On-page factors (such as site speed) are considered more of a prerequisite for ranking higher in search.” So, even if your site ranks well in a other categories (quality content, social signals, backlinks, etc. ), a slow load will detract from your overall ranking. So, to make Google happy and avoid losing potential customers – implement the following tips to speed up your site. Large graphics and photos take a long time to load, and it doesn’t take many images within a blog post to slow down your website.. If you run banner ads in your sidebar or include photos in your posts, it is worth your time to make those images smaller. 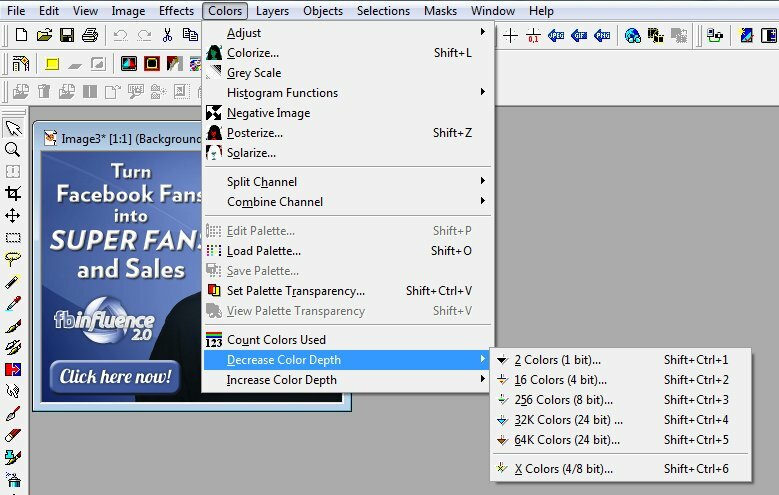 Use your favorite image editing program (I use an old version of Paint Shop Pro) to change the colors used from 16 million to 256, or the resolution from 300 dpi to 72 dpi. 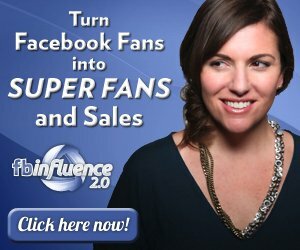 For example, I'm currently running an ad for FB Influence in the sidebar of this blog. The merchant's original image is 300 x 250 pixels and 219.7 kilobytes in size. The following graphic shows how I reduce the color count using Paint Shop Pro. The final image has a file size of only 74.2 kilobytes. When you compare the two, you can see a TINY loss of quality… but not enough that your visitors are ever likely to notice or think your site is cheesy by result. If you don’t have Paint Shop PRO or Adobe Photoshop, you can use a free graphics editor such as GIMP to resize and save your images. Simply deleting unwanted comments and spam comments does not get rid of them forever. 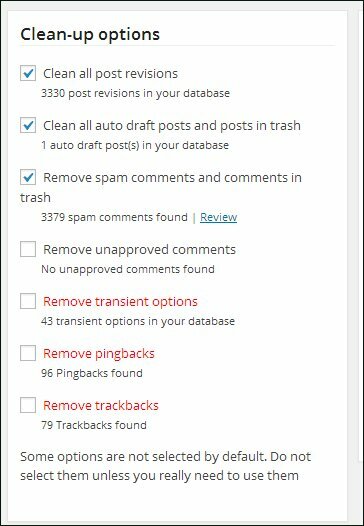 Rather than mucking about in your WordPress database using phpMyAdmin, you can remove post revisions, comments in the spam queue, and all those unapproved comments using WP-Optimize plugin. Here's what the plugin found on RosalindGardner.com. So, OK… apparently I don't always practice what I teach.I found 15 unused plugins on my personal blog as I was doing research for this article. Bad me… but they are gone now. Seriously, I installed Flickr Photo Album and Flickr RSS on my blog many moons ago, used them for a little while and didn't delete them when I stopped using them. Unused plugins are a drain on the system, even when you are NOT using them. Broken links are bad! They bog your blog loads, cheese off your readers, and negatively impact your Google ranking, so just get rid of them! Word of warning – activate the Broken Link Checker plugin only when you want to check your links and then deactivate as soon as you are finished. If you have one blog, having your hosting service on a shared server such as BlueHost will most likely suit your needs splendidly. However, if you run numerous blogs, plan to start a membership site or any other type of site that you know (hope) will consume copious bandwidth, you really should get set up on a VPS – virtual private server. I have been absolutely thrilled with my hosting service since moving to them earlier in the year. 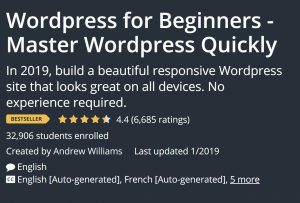 After they handled the complete transition of numerous sites with a vast cornucopia of plugins and other software, I noticed an increase in site speed and an increase in site speed immediately. A cache plugin generates static html files from your dynamic WordPress blog. After a html file is generated your webserver serves that file instead of processing the comparatively heavier WordPress PHP scripts.I use W3 Total Cache. CDN is the acronym for ‘Content Delivery Network' which typically uses multiple data centers to serve content with high performance… in a word… ‘fast'. Cloudlare and Stackpath (formerly MAX CDN) are two popular content delivery networks. I've made a LOT of changes to speed up this website (and my other blogs) in the last few months and they are definitely working. Faster than 83% of websites tested works for me… especially since I tested some really famous bloggers' sites and they come in at the 60% range. Ya… can you hear me saying ‘na na na NA na'. LOL! Blog Bloat? Pull that Plugin! I have learn so much from you Rosalind, advice me what to do with comments on my site with website link either to share their website or affilaites link? Thanks for the great information Ros and for letting others know about your experiences with Website Managers. While we have focused on various levels of shared hosting and custom-built dedicated servers, we see a need for VPS servers, so are building some. Those will be available soon. For the caching plugins, I found the WP Super Cache to be more user friendly than W3 Total Cache, while the latter has many more options for advanced users. WP-Optimize is a real time saver. Until using that, I was cleaning the databases manually in phpMyAdmin, which I tell most people to stay out of without proper training. For optimizing graphics, I too use PaintShop Pro. Those who want an easier program, I recommend Photo Pos Pro which is also free. Awesomely (is that a word?) good information as always, Jim. Do you go over this in your training course? You mentioned you run a “dedicated server.” Is that with WebSiteManagers.net? 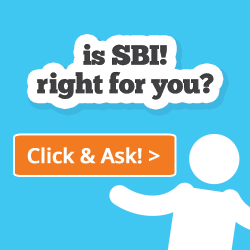 Is a “dedicated server” necessary for websites that have a lot of visitors? I went to the WebSiteManagers.net website and it lists different plans depending on GB and bandwidth, server specs, etc. I’m a complete newbie and wouldn’t know where to start. I also checked out the MaxCDN website. Same thing. I have no idea what I’d need. Would you need them both to have a fast-loading site that Google might rank higher? Also, they both had monthly rates in the $100+ range, so obviously you’d have to be making enough to make it worth your while. Thanks for any info, Ros. Seriously thinking about signing up for your course! I do cover basic aspects of web hosting for newbies in my Affiliate Blogger PRO course. But to answer your question, you would not need a dedicated server if you are just starting out. Just basic website hosting is enough to get the ball rolling. The biggest issue for new bloggers is to use a service that offers superior customer service… and that I get from WebsiteManagers and BlueHost. Hope that helps! I think good site speed is just a basic. Quality content and backlinks as well as social engagement are much more important overall when it comes to Google’s ranking factors. You mentioned using a VPS hosting and I’ve been looking at VPS vendors lately because I want to use Prosper 202 for tracking. I went to WebSiteManagers.net but didn’t see a VPS option but rather a dedicated server which is not exactly the same thing. When I downloaded Prosper 202 they recommended BeyondHosting.net or Hostwinds.com. Beyond Hosting is 59.99/mo for managed Windows VPS (49.99 for managed Linx VPS) while Hostwinds is starts at $13.50/mo for managed VPS (Linx or Windows). With the very reasonable cost for Hostwinds I’m going with them because of the increased website load speed even over shared hosting at Hostgator or BlueHost. It’s only $4.00/mo more and Google does look at website load speed for ranking. You are absolutely correct, I do run a dedicated server. My bad, will correct the error. Good advice, I will be giving my dashboards a house cleaning too. I am so happy that you mentioned not to leave the Broken Link Checker running all of the time. I installed a broken link checker, not realizing that it would check even Google’s ad links and I believe it is one of the main causes of my Google Adsense account getting shut down. One quibble: changing the DPI setting on a photo has no effect whatsoever on file size, it only affects how large it will print. Actually, reducing the number of colors used does change the file size. The first one (16 million colors) is 219.7kb, while the 2nd image (256 colors) is 74.2kb – or about 1/3 the original weight.